NAVEEN IS THE AMAZINGLY ARTIST AND LADY-BOSS BEHIND SPURLE GUL STUDIO. 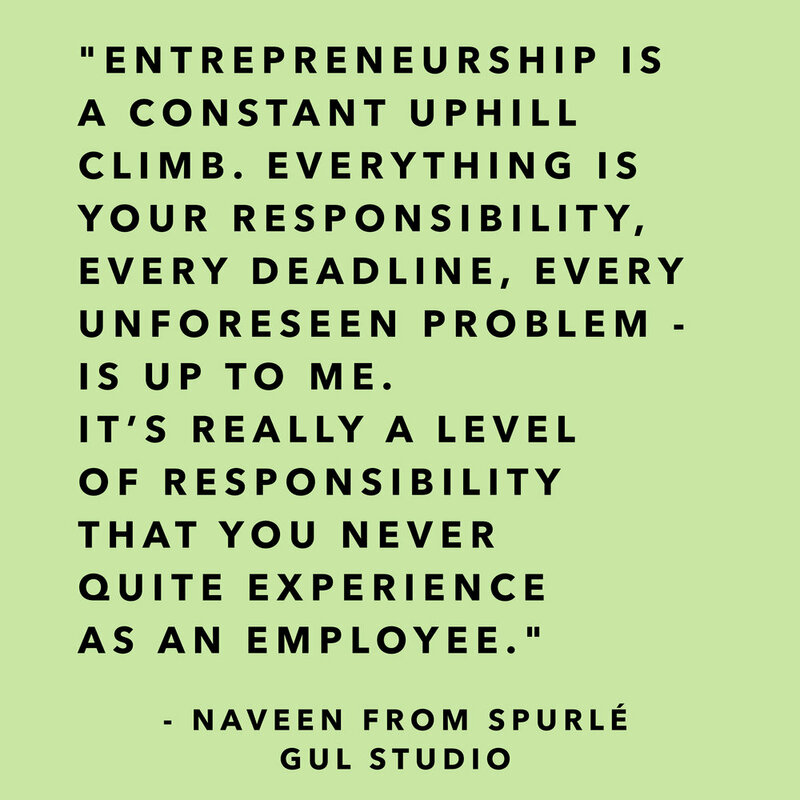 I am Naveen, owner and artist at Spurlé Gul Studio, a custom calligraphy and stationery design boutique. I sell my wares and calligraphy services through my website www.spurlegulstudio.com. Along with handmade paper made by me, I stock specially designed varieties made by artisans all over the world as well. My studio also provides complete design services for stationery items that serve any number of events/occasions. From conceptualizing an aesthetic to delivering the finished product, my little studio is equipped to provide a one stop shop to anyone looking for bespoke calligraphy services and unique paper goods. Even though my education and professional experience would indicate otherwise, I have always been an artist at heart. It took me a while before I felt confident enough to share my progress with the world through social media but the overwhelmingly positive response I received from a universally supportive community of creatives just infused me with the confidence to turn the hobby into a business. To feed my obsession with texture, I discovered the therapeutic art of papermaking and ended up knee deep in pulp of all colors just waiting to be transformed into handmade paper. I still remember the moment my first batch of black cotton rag paper came out looking just perfect! The amount of love and encouragement I receive from all the people in the industry just keeps on pushing me to pursue this art further and in the process, discover truths about myself that are exposed only through the process of creating. It's anxious work, being an entrepreneur. Before I started off as one I had thought that staying ahead of the regulatory requirements like licenses, taxes etc. would be the hard part. But as it turns out, those things are hard, but harder still is the constant fear of stagnating. Innovation is the key to running a business that is satisfactory both on a financial and personal level. Entrepreneurship is a constant uphill climb. Everything is your responsibility, every deadline, every unforeseen problem - from the printer running out of ink at the worst moment to making sure your insurance premium is paid up - is up to me. It’s really a level of responsibility that you never quite experience as an employee. On the flip side, the one thing that really makes it all worthwhile is the creative freedom. You just can’t beat waking up every day with the excitement of creating something new and beautiful! I think the motivation is perpetual when you are doing what you love. Feedback from your peers and the people you look up to also helps a lot! For all the anxieties social media has wrought, the one thing it does have going for it is the ability to make those who inspire you to be accessible. On the personal front, the process of always learning something new through experimentation has taught me as much about myself as it has about my craft. On week nights, most of whatever little spare time I have is spent online looking for inspiration and learning about new and different techniques to do the things I am interested in. But the weekends are fully devoted to winding down, day and night! Catching up on sleep, going out with my husband for picnics and cuddling up in bed to watch movies are some of my favorite ways to spend the two days I have devoted to stepping away from the business to focus on relaxation. Don’t sweat the small stuff. It is embarrassingly easy to get bogged down by the minutiae of running your business but the less you let it get to you, the more time you will have to focus on why you got into this gauntlet in the first place. I found that it was a lot better if I just went ahead and spend the money on services and people that could help me keep my ducks in a row than trying to learn everything myself to keep costs low. Took me a while to realize that my time to be creative was for more valuable than the little bit of extra money I had to spend on getting a good tax consultant. It was Game of Thrones season so that’s pretty much all I had on my mind the last couple of months! I really enjoyed the Big Sick, though. The last book I read was Forty Rules of Love by Elif Shafak and it was a phenomenally decadent read. Top 5 items on your bucket list? Thank you so much Naveen for spending time with the RINGLET ladies. Follow Naveen here & on instagram. Sign up with your email address to receive RINGLET's Friday newsletter.